Recently I was given the opportunity to check out a product from Go7Gaming’s Value Line of inserts. That product was the KOTNY-001 Storage Solution for either King of Tokyo or King of New York. I received it in a flat rate shipping box with a big bundle of wooden sheets wrapped together in a large ziplock bag with some full color instructions explaining how to put everything together. After removing the sheets from the packaging and reading through the instructions, it was ready to assemble. Now then, let me explain exactly what this product is and what it does. First off, this is an insert for the either version of the game King of Tokyo, the original one or the newer version made in 2016. It will also work with King of New York, which is incidentally what this review will be based around. 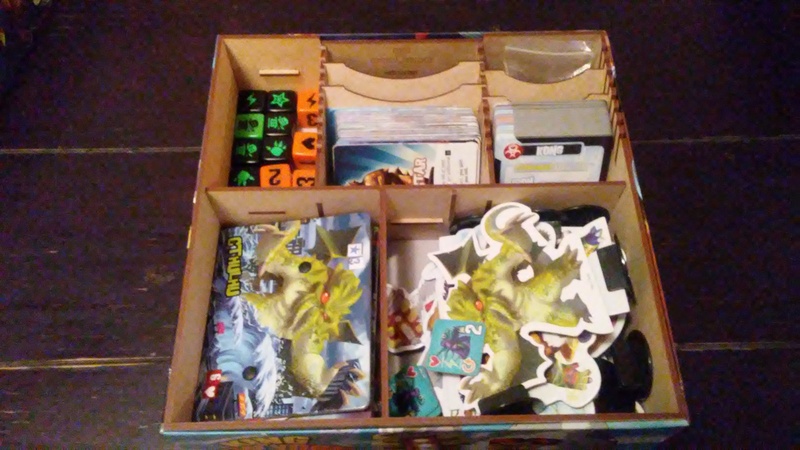 Once it’s been assembled, the insert makes it possible to keep all of the different monster boards, monster standees, dice, tokens and cards together in one organized place. There’s even a lot more room for extra monsters, dice and cards. For me, I added in a few extra monsters from some of the Monster Packs, as well as the Power Up expansions. There’s even some extra dice from the Halloween expansion thrown in to boot. Of course you’ll see what I mean in the pictures below. With all of that said, let’s go ahead and get right into the assembly. The first thing to do is separate out all the different wooden sheets. Every piece is cut so that they’re fairly easy to punch out from the board. 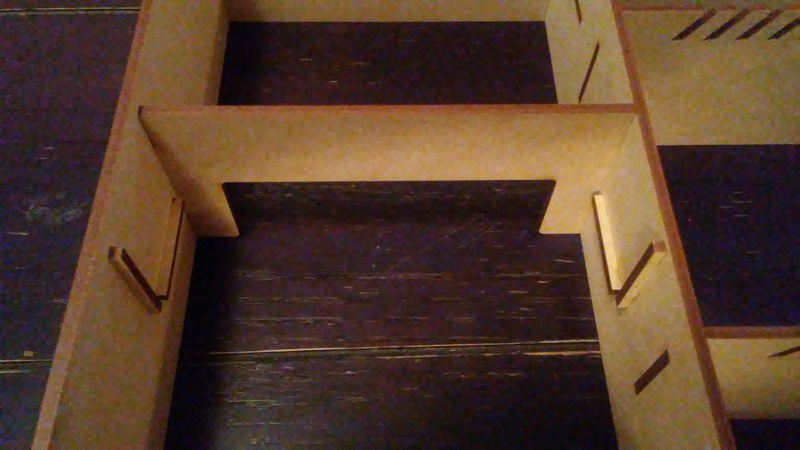 You need to know that when putting one of these inserts together, it’s best to dry fit everything first so that you know how it’s going to go and then break out the glue and fit each glued piece together. You can also use tape if you’d prefer, but glue will last longer and be more resilient. In the course of this review, I won’t be pointing out each time you should use glue. 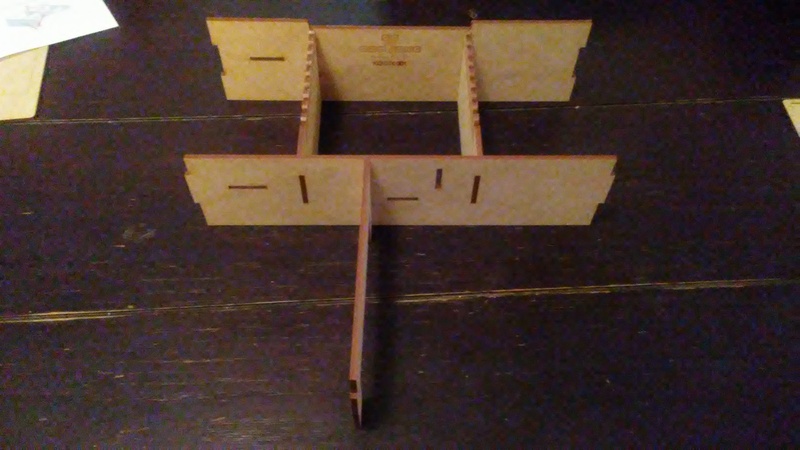 Just be aware that if 2 pieces are being connected, you probably want to put some glue on them to hold them together. 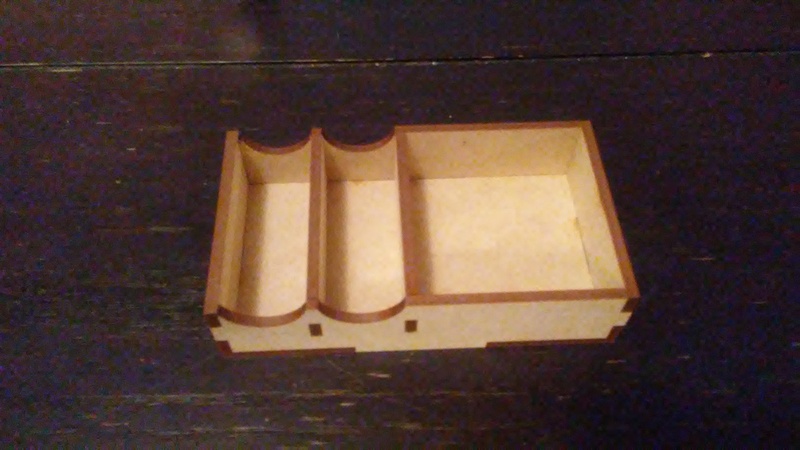 This insert consists of 3 different sections; the main insert, the token tray and the tile tray. We’ll start with the main insert. 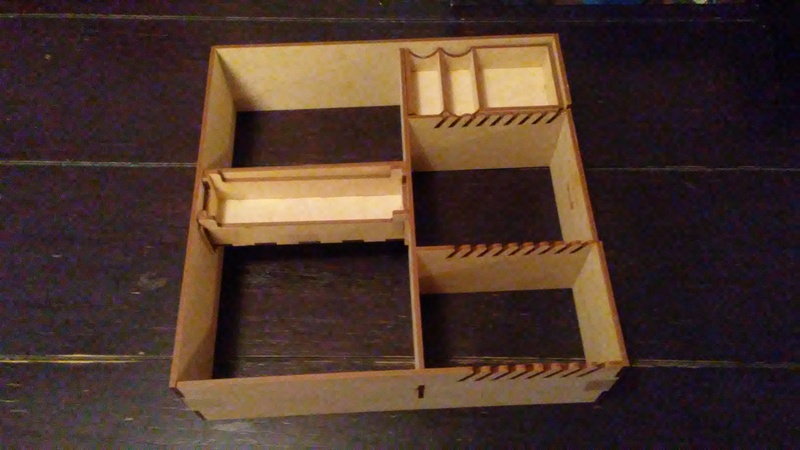 You’ll start off by taking the inner wall and connecting it to the 2 smaller inner divider walls, making sure to note the direction of the angled slots on the top. You’ll also want to connect the open wall and connect it to the other side of the inner wall. What you should end up with is something like this. Next you’ll connect the outer wall to the small inner divider wall. What you’ll have is something that looks like this. I’ve rotated the assembled pieces so that you can see the Go7Gaming logo on the inner portion of the outer wall. Next you’ll connect the 2 outer walls to the inner wall and the previously connected outer wall. This is what it should look like. Finally you’ll connect the last outer wall to the rest of the assembly. It should look like this when finished. 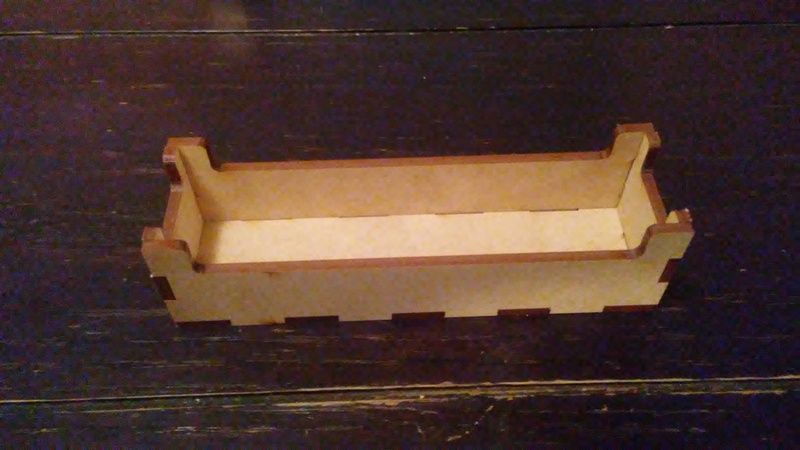 The next step is to glue in the small tray supports into the walls of the insert. There are 2 sizes so make sure that you put the right ones in the right place. If you’re building for King of Tokyo, this first set of supports are the only ones that you need to use. These are placed in the upper right corner of the insert. Seen below. 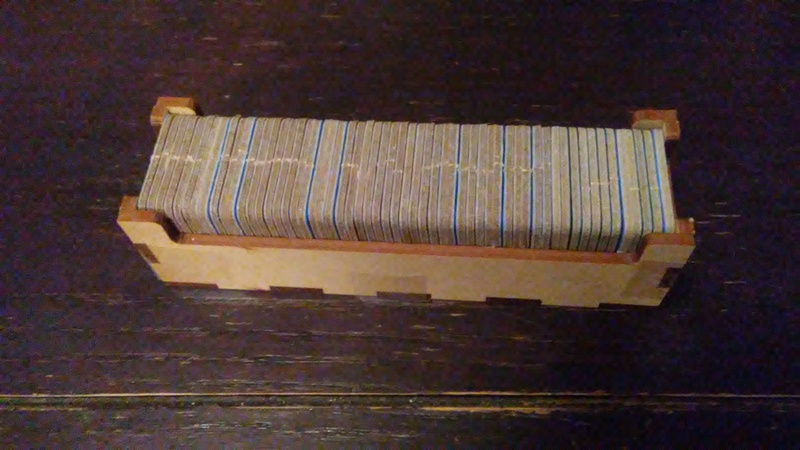 Since I’m assembling this insert for King of New York, I needed to also place this extra set of supports into the lower left section of the insert. Seen below. Now that the main insert is assembled, we’ll move on to the token tray. To assemble this you’ll start with the base of the tray. Next you’ll take the 2 divider walls and connect these to the 2 longer outer walls. What you’ll get is something like this. If you’re going to use this for King of Tokyo, then the inner wall on the right of the picture would not be connected. You’d only need the one inner wall. 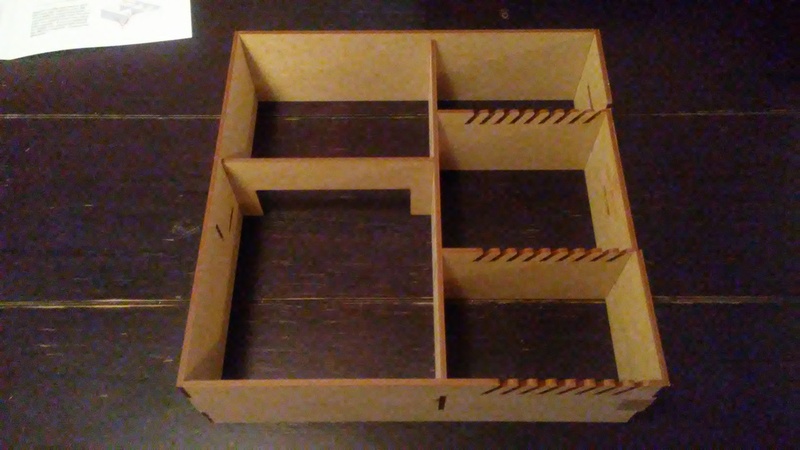 After you’ve got those together, you’ll place the assembled piece onto the base and then connect the 2 shorter end walls. This is what it should look like when you’re done. The tile tray is only used for King of New York, so if you’re planning on using this insert with King of Tokyo, you’re pretty much done. For those of us King of New Yorkers, let’s continue. You’ll start off with the base for this tray. Next we’ll attach one of the long walls to the base, along with the 2 short end walls. You’ll finish it up by adding the other long wall to complete the tile tray. When it’s done it should look something like this. With everything completed, simply set them aside and let the glue dry overnight. 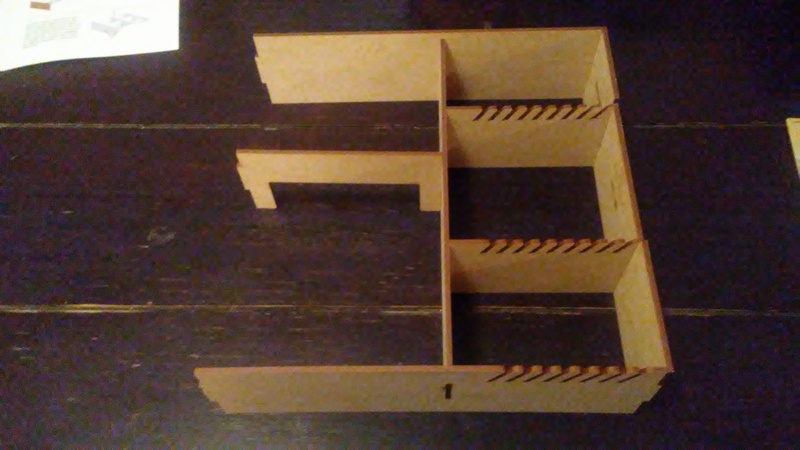 Once it has you can place the main insert into the box and put the dividers into place. You’ll then be able to start adding all of the different components of the game into the insert. As you can see below, I’ve added a few more monsters, cards and dice that are not included with the base game. Here are some pictures of the finished product. Here I removed the tile tray and token tray so that you can see the areas beneath these. Under the energy cubes and round tokens is room for the dice from both this set and the Halloween expansion. Beneath the tiles is a little bit of space for some of the larger monster standees to stretch out. 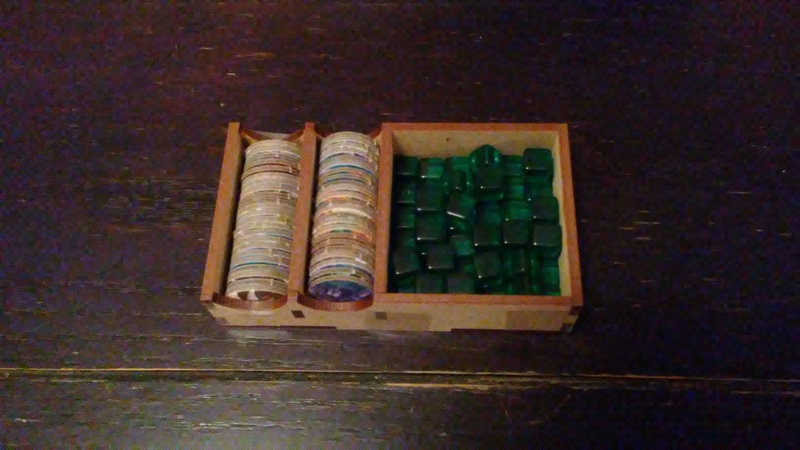 Here are the token and tile trays completely filled up. With everything put back into the box, there’s just enough room for the board to fit in nicely. 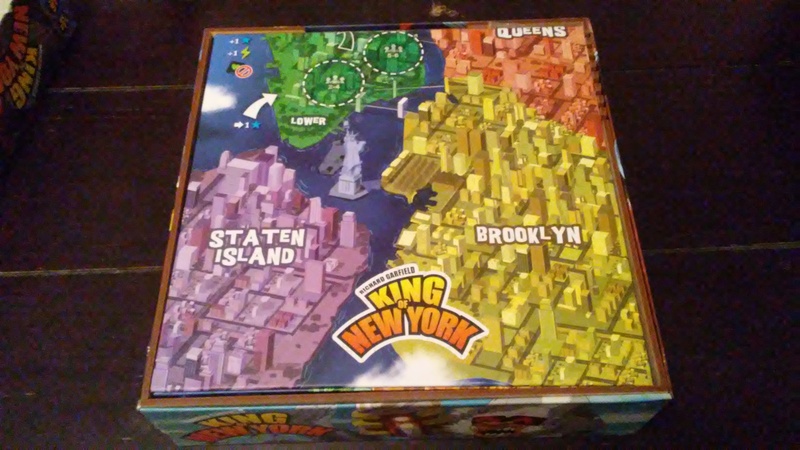 I was surprised that even with King of New York’s larger folded board, there’s still enough space so that it fits flush with the sides of the box. With the lid closed, there’s no bulges or raised lid. Normally I would cover all the different pieces and component of the game. What I’ll do in this case is describe the packaging and the insert itself. Everything came packed inside a flat rate shipping box. The pieces were placed inside a large zip lock style bag and shrink wrapped together. The wooden sheets are fairly thick and sturdy. Each piece appears to be laser cut and is easy to punch out from the boards. Everything looked good and solid so there was nothing to complain about here. Of course there was no glue or tape included, you’ll have to supply that yourself. 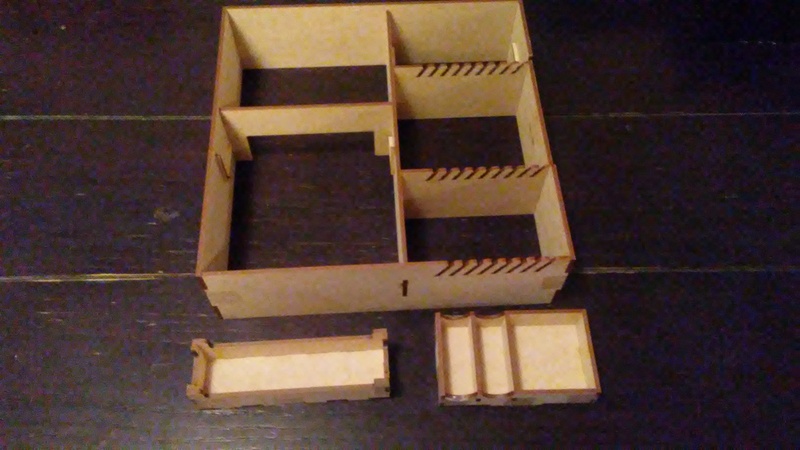 Assembling the insert and trays was fairly simple. I really had no problems with it. Overall I’m very pleased with the start and finish of this project as well as the look and feel of the insert. Instead of a rulebook for a game, this insert comes with a folded sheet of instructions. Everything was easily explained making it easy to assemble. The assembly process was walked through step by step so that there was nothing difficult about putting it all together. There were even some nice pictures showing how everything should look and where each piece should go. Thanks to the great instructions, I had no troubles at all. Overall I’m very pleased with the instructions. They are clear, concise and helpful. Normally I would explaing my thoughts on the game along with the basic principles of how it’s played. 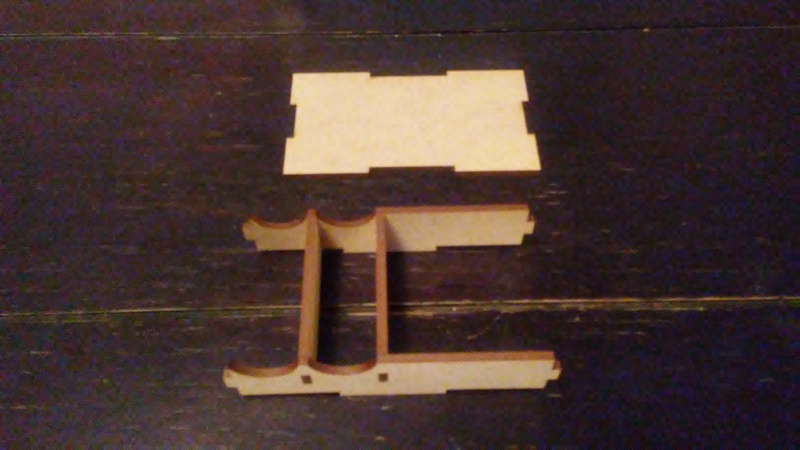 Instead of doing that, I’ll give my thoughts on the assembly process and the functionality of the insert. Thankfully this insert didn’t take a long time. There were only the 2 smaller trays and the one larger insert for the box. As you can probably tell from the pictures, it wasn’t that difficult either. Everything was fairly simple to put together. I will say that I needed to go onto the website to determine exactly what pieces went where, as there was nothing in the instructions about that. As I mentioned earlier, I was able to add some extra content from some of the smaller expansions to the box. Even afterwards there’s still some room left over. Unfortunately adding the Cthulhu monster pack, I didn’t have enough room for all the smaller square tiles so I had to sit some of them inside the bigger space where the monster standees go. You can see that in the pictures. I will say that I fully expected there to be a problem with the board, but that wasn’t the case. 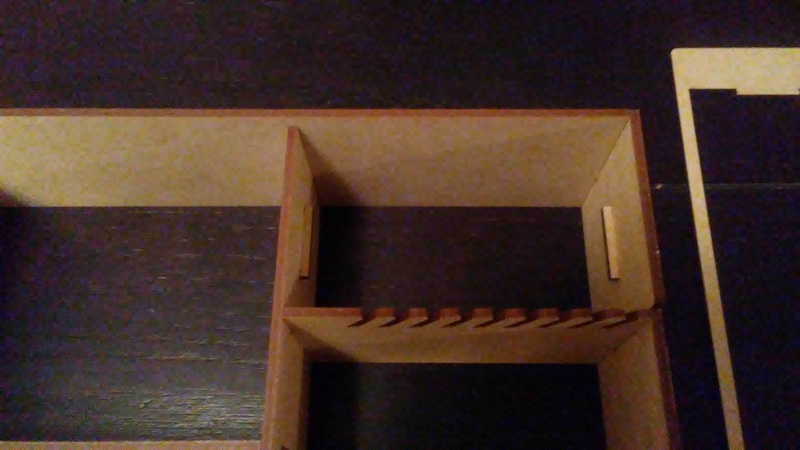 The folded board fit perfectly on top of the insert allowing the box lid to go all the way down. 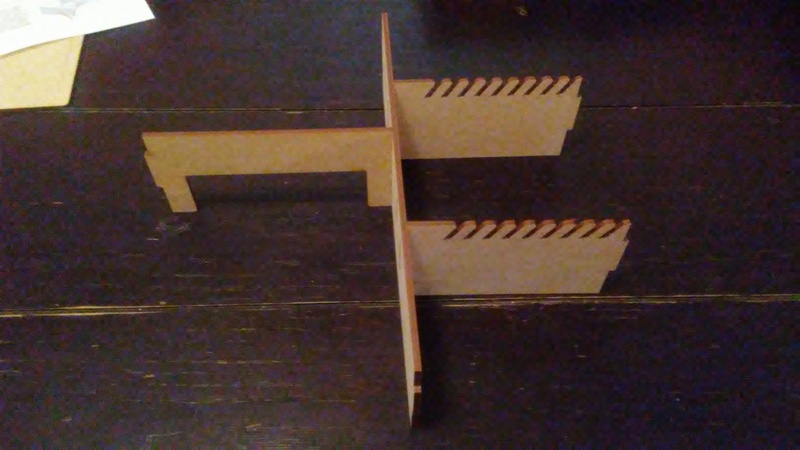 The board sit’s flush with the bottom of the box. That really surprised me. The box has a little more weight to it now, but it’s a lot stronger too. I’m not sure what else I’ll be able to add to the box, but I can’t wait to find out. Hopefully there will be plenty of new products to fill out my box to the rim. The trays are great. They make setting up the game a lot quicker and easier. Overall, I’m very pleased with the finished product. 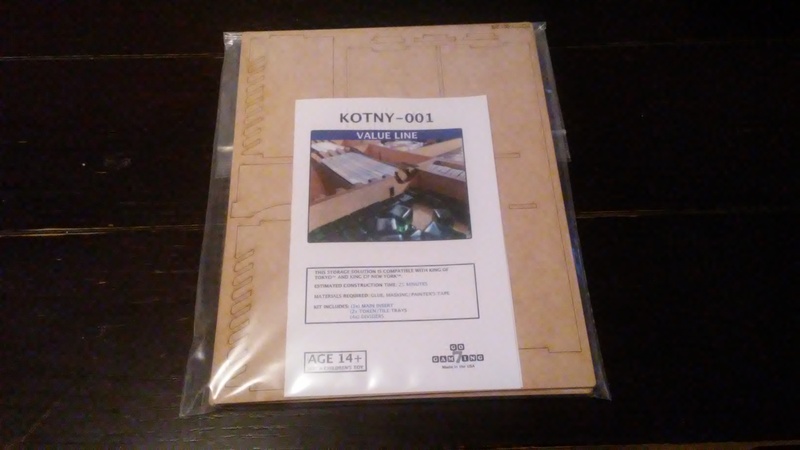 The KOTNY-001 Storage Solution for either King of Tokyo or King of New York is a great organizer that works for either game. It’s got plenty of room for keeping the core game along with several smaller expansions as well. The assembly process was very easy and didn’t take a lot of time either. The instructions are very thorough and easy to follow. As I’ve already stated, there’s lots of extra room which I look forward to filling. Overall I’m very pleased with the look and functionality of the insert. I would highly recommend it. It’s a marvel of craftsmanship. You’ll be happy with the insert and the great customer service that you’ll get from the people at Go7Gaming. Guaranteed. 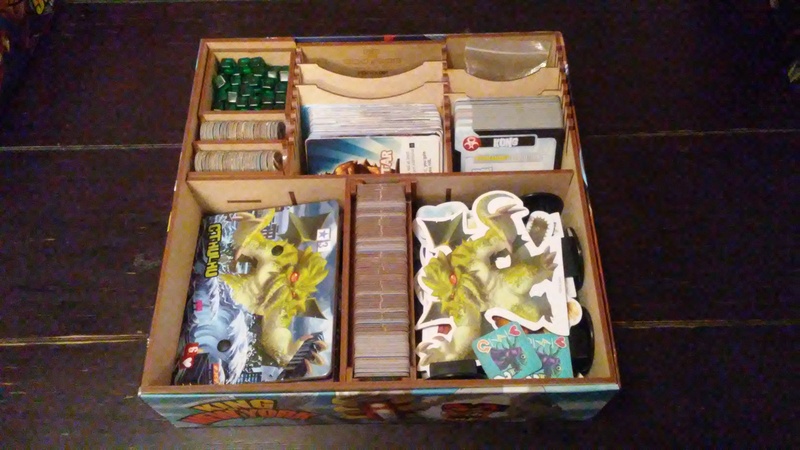 This entry was posted in Reviews and tagged 7, base, board, board games, card, card games, games, gaming, go, go7gaming, insert, king, king of new york, king of tokyo, kit, kotny, kotny-001, new, new york, organizer, solution, storage, storage solution, tokyo, york. Bookmark the permalink.